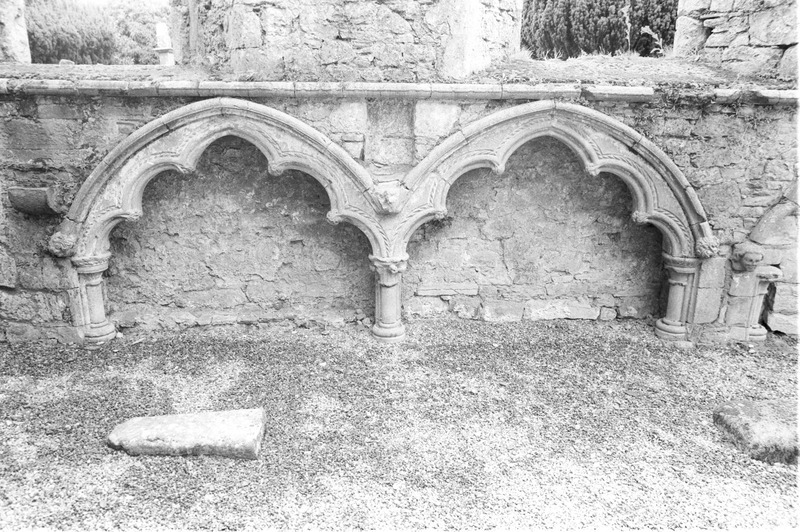 “St Mary's Collegiate Church, Gowran, Co Kilkenny, interior - nave, south aisle, tomb recess,” Gothic Past, accessed April 20, 2019, http://gothicpast.com/items/show/1299. Photograph by Roger Stalley. View of tomb recesses below roll - and - fillet stringcourse in the south aisle of the nave. Cinquefoil arches have cable moulding and cusps carved with stiff - leaf foliage. Capitals are of bell and foliate design and have nailhead ornament also. Plain shafts rest on water - holding bases. Hood moulding has roll - and - fillet moulding terminating in foliate and head carved label stops.